Alpha in prisons was launched in December 1995 in response to demand from prisoners who had the desire to live changed lives. Alpha runs successfully in all types of prisons and correctional institutions for both men and women, and is also used in young offender and juvenile institutions. Recent studies show that 68% of offenders are re-arrested within five years of release. However, those inmates who complete Reentry Initiatives have an average recidivism rate of 20%. This is exactly the reason why our work is so vital to the safety of our citizens and to the reentry success of our inmates. Through an interdenominational, national network of churches which regularly run Alpha, Christians are sharing their life changing experiences with inmates in our nation's prisons and jails. Through Alpha and the local church, we believe that fewer people will return to prison once released. Alpha is for those inmates who volunteer for the program, taught by trained volunteers, is low key and not-threatening approach to a values driven lifestyle. Alpha generally runs over a period of 15 weeks and can be present shorter or extended as determined by the Alpha Volunteer and Chaplain. At each 2- 2.5 hour sessions the is fellowship over food and/or drinks, where possible followed by a talk on the subject central to the Christian faith. Those talks are presented through the Alpha course video series. After the talk, participants divide into pre-arranged small groups, in which they remain for the duration of the Alpha course. The groups provide participants with opportunity to discuss the talk in an environment where each person is free to ask or say whatever they wish. We want to equip you with all of the essential resources and training for you to successfully run Alpha for Prisons & Reentry. Many people in prison feel a desperate sense of loss and have a deep hunger for meaning in life. Jesus Christ is the only one who can satisfy this hunger. Alpha helps answer some for the questions about the Christian faith and the meaning of life . The vision of Alpha for Prisons is the evangelization of our prisons by giving every man and woman in prison the opportunity to come to know Jesus through participating in the Alpha course and the transformation of society through the establishment of prison ministries in local churches. * 7 million Americans in jails, prisons or on parole or probation. * 67% will re-offend within 3 years of release & 40% returning to prison. * 50% of inmates that try Alpha report making a commitment to Christ or Re-dedicating their life. The Gospel message proclaimed through the Alpha ministry helps these men and women to redefine their lives within a faith context, and to reclaim and live lifestyles driven by grace, mercy, and appropriate attitudes and relationships. Exposure to devout and committed Christian volunteers, who are living and demonstrating their faith through their service to others, presents excellent role models to the inmates. Ron Smith is a retired Police Officer who hosts the Alpha course for prisons in Overland Park, KS. This is his experience of the Alpha course. 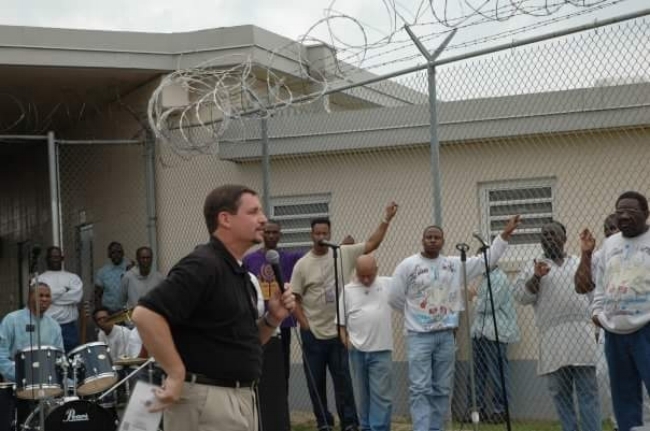 Terry Strom is a National Alpha Prisons & Reentry Advisor and Executive Director of Ministry for Discipleship Unlimited which operates faith-based and Re-entry dorms in multiple prisons in Texas. Alpha Prison and Community Ministry currently provides Alpha Courses in ten Connecticut correctional facilities and two community programs - one at a center administered by the Connecticut Community for Addiction Recovery (CCAR) and the other at Isaiah 61:1, a Department of Correction halfway house. From 7/1/07 through 12/31/16, 3,473 Certificates of Completion have been signed by the Department of Correction Director of Religious Services and presented to offender participants. The Ministry provides a sense of hope that no matter the circumstances there is an opportunity through a personal relationship with the Lord to have inner peace and a life worth living. Data is being collected to support our strong belief that the Alpha program is extremely effective in reducing recidivism.